So my Keyboardless Kindle 4 (we can call it that since it is the first Kindle device to hit the market that features software 4.0) arrived late in the evening. Surely enough my curiosity got the better of me and armed with a screwdriver and tweezers I set out to take it apart and see what is inside. Normally one would open a Kindle by prying the back cover off with something sharp and pointy (screwdriver or knife). Kindle 4 resisted my attempts to open it up and when I finally did I understood why – top and bottom latches are much stronger than the rest so you need to bend the center of the cover up to let them slide out. On top of that it turned out that back cover is glued to the internal battery cover with adhersive gel. You need to apply some force to pop it open. 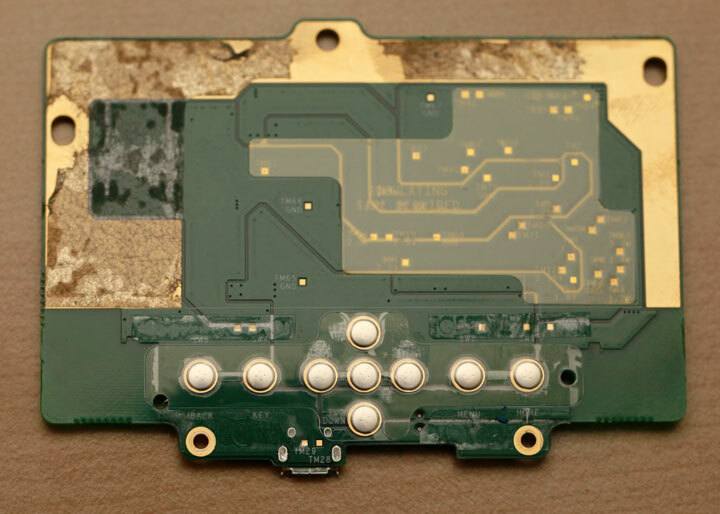 If you decide to repeat my steps – be warned that your warranty will definitely be voided. 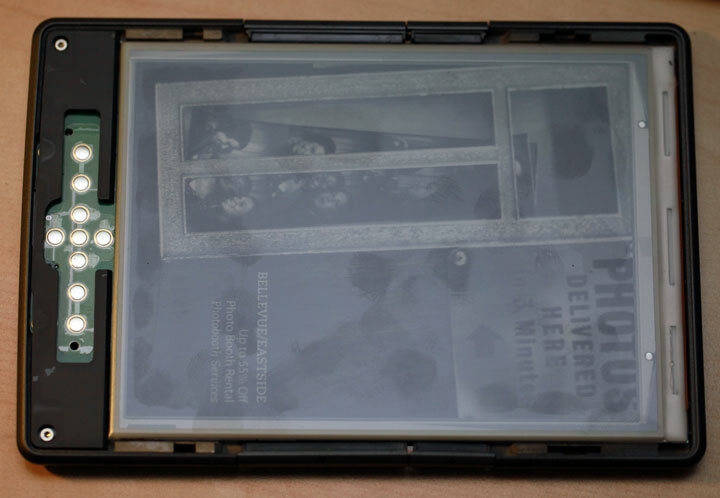 My Kindle 4 device bears clear signs of being opened. There is no way to do it gracefully. Clearly the K4 is not meant to be user-serviceable or serviceable period. Popping the back cover off reveals battery and motherboard. Most of the interesting stuff is covered with metal and I’ll leave it at that for the time being. I don’t want to ruin the device until I play around with the software. But fear not – soon enough the mission will be complete and I’ll post pictures of bare motherboard even if I end up bricking the device. On the back of the cover there is RFID tag manufactured by UPM. It reads “UPM + 253_1″. Perhaps it is used to automate the personalization process (Kindle comes to your doorstep already configured with your Amazon account. 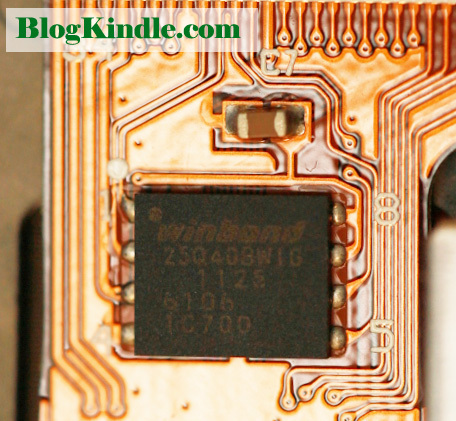 It turns out that Amazon started putting RFID tags inside Kindle 3 and I missed it during my last disassembly. 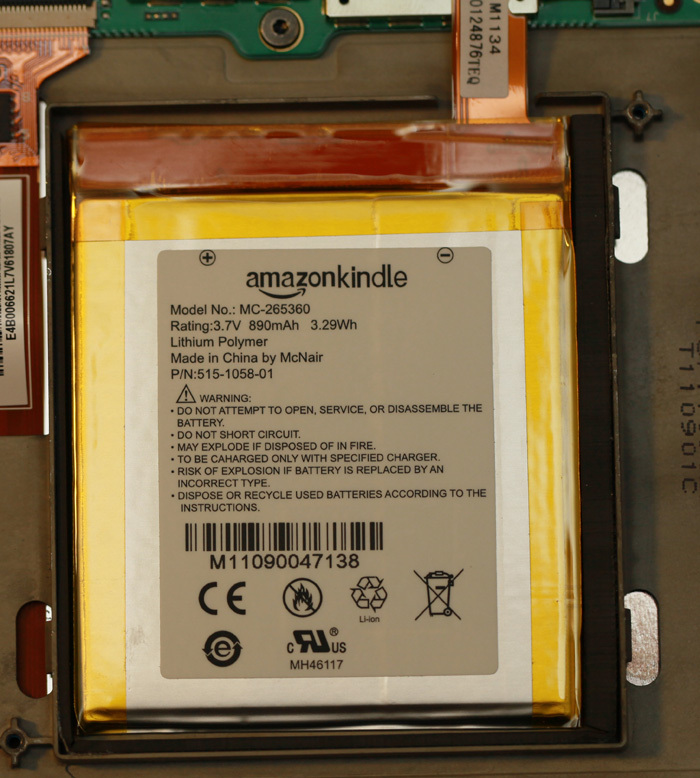 Internally Amazon uses T-6 screws rather than Philips like in Kindle 3. 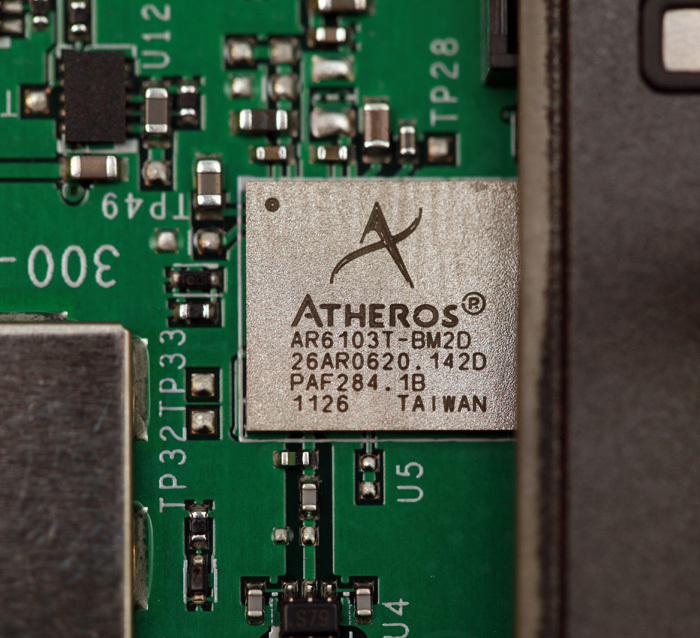 2.4GHz 802.11b, 802.11g and 1-stream 802.11n. This means that it can only put though up to 72.2 Mbps in the 802.11n mode. Perhaps Amazon will add some of these things in the future. Or perhaps they will leave this space empty forever to keep the weight and cost down. 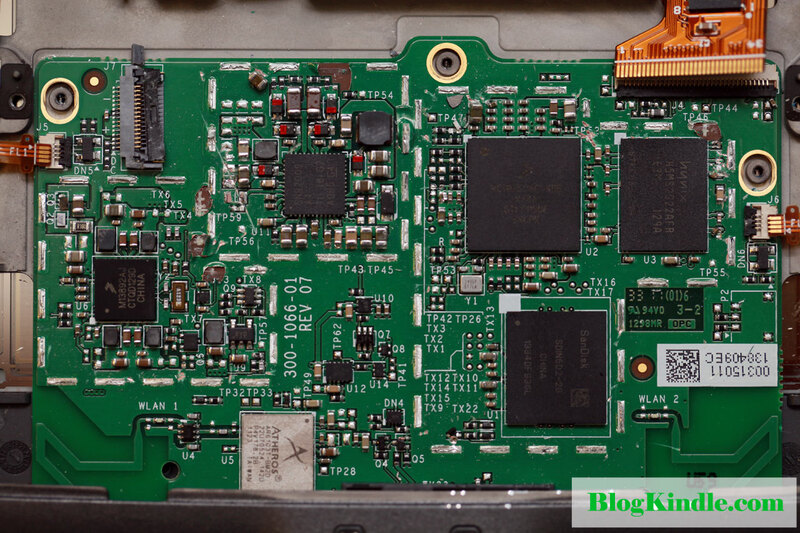 If there is a serial console like in previous Kindle generations, it is not obvious or easily accessible. 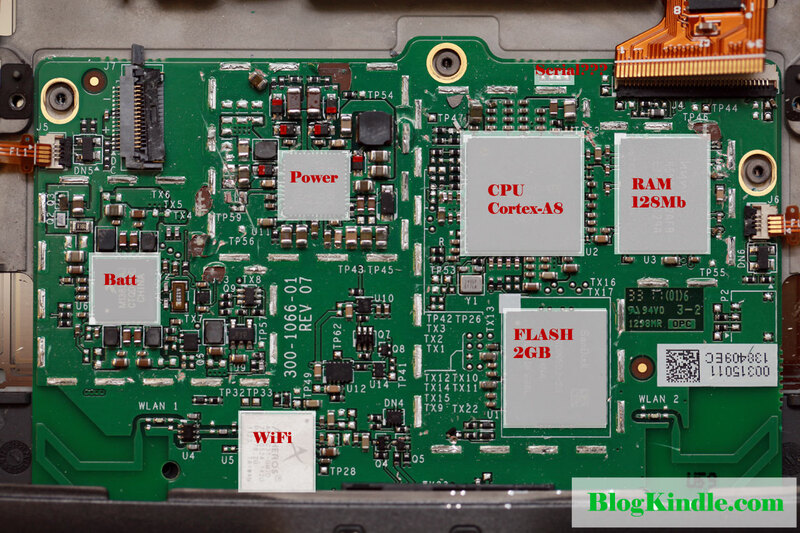 Memory is Hynix H5MS2G22AFR E3M 129A which is 128 megabyte module (Kindle 3 has 256 megabytes).